Patience is certainly a virtue, especially as it relates to fantasy baseball. However, with the hard luck season that Justin Turner had apparently decided to embrace in the first two months of 2016, he likely tested the patience of owners throughout the fantasy landscape. As we approach the end of the month of June, though, his luck appears to have shifted for the better. Before this 2016 season got underway, Justin Turner would have hardly represented a catalyst for many as they evaluated the offensive talent possessed by the Los Angeles Dodgers. In fact, many had called for him to be supplanted at the hot corner, as he spent the bulk of both April and May struggling, as some poor luck appeared to have got the better of him. But just as the weather in Southern California has heated up, so has Turner, as well as the suddenly upstart Dodgers. Turner’s first couple of months of the 2016 season don’t necessary reflect a starting caliber player at the hot corner. He finished the month of April 17th in WAR, at a 0.3 mark, with a negative offensive rating. May represented a similar stretch for Turner, as he went for a 0.6 WAR mark, primarily thanks again to his defense (as he finished with a negative Off for a second time). His ISO in April was among the worst at the position, with a .078 mark, while his wRC+ painted him as a below average offensive player, at a figure of 85. May did show improvement in each of those regards, however slight, as his ISO came in at .095 and his wRC+ rose up to 96. Where Turner’s numbers begin to turn ugly, both in April and May and as well as in June, are in his batting average on balls he’s put in play. In maintaining a relatively high contact rate, Turner has posted BABIP figures of .302, .239, and .236 in the first nearly three months of this 2016 campaign. A number that is increasingly blamed for player struggles, as the game continues to adapt more to analytics, may certainly be largely at fault in regard to Turner’s slow start. Turner’s production in April and May wouldn’t seem to lend itself to numbers of this quality. While he’s not blowing anybody away with that average, his overall OBP is strong, and his strikeout and walk numbers fall right in line with his career averages. He has his wRC+ up over the 100 threshold and would appear the victim of bad luck, at the mercy of BABIP, more than anything. With that in mind, what exactly has changed in the month of June, as we begin to near the end of the month, that has allowed Turner to catch fire? There are a couple of extremely notable things about his month of June. The first is his BABIP, which is still very low. This comes despite a 48.4% hard hit rate. Turner’s apparent solution for beating BABIP is also reflected in these June numbers. Home runs are not factored into BABIP and Turner has seven of them in the month, accounting for 70% of his big flies for the year (math so simple even an English teacher can do it). It’s the power that has allowed him to experience his best month, in terms of average, even with a paltry BABIP that is as low as it is. Interestingly enough for Turner, the batted ball and swing trends haven’t fluctuated too much based off of his career norms, which tend to vary over the course of a season for any hitter. As such, there isn’t enough in his swing tendencies to indicate that he’s necessarily done anything wrong to experience the struggles that he did in April and May. He still hit the ball relatively hard, with a 32.4% Hard% in the month of May. A sky high groundball rate could be attributed to his struggles in the month, as he nearly touched 49% in that regard. Again, the GB rate skyrockets, likely leading to some of his May demise, even with a high percentage of balls being hit hard. His BABIP for the month was just .239. 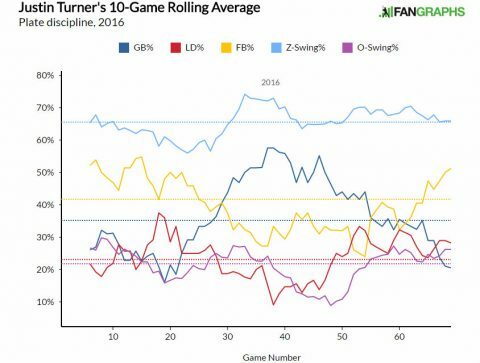 And while it’s difficult to dismiss a rough start for a player as bad luck without citing his approach or anything of the like, as we thrive off of being able to quantify things, Turner is swinging at less pitches than ever (42.8% Swing% is a career low) in 2016 and making more consistent contact than at any point during his time in LA (85.1%). He’s sporting a 6.4% swinging strike rate. All of these are probably what you’d want to see if approach was your concern, especially because there are some who have perceived that his approach was in a position to be questioned. So just what do current and prospective fantasy owners, with the latter still hoping to buy low on the Dodger third sacker, do with Turner as his BABIP continues to dwell at such a low point? This is a player that has posted a .317 combined average over the past two seasons, while reaching base at a combined clip of about .351, and posting wRC+ figures over 140 in each of the last two seasons. Additionally, pitchers aren’t exactly attacking Turner any differently. His 2015 heatmap looks frighteningly similar to that of 2016. All of this culminates in one general concept as it relates to Justin Turner: patience. Turner has been a high quality player for the last two years, and given his approach and batted ball tendencies, there’s no reason to think that all went away over night. While his BABIP continues to bottom out, one would imagine that it has to even out over the second half of the season. And when it does, Turner will make fantasy owners quite happy that they stuck with him. We hoped you liked reading Justin Turner’s Battle with BABIP by Randy Holt! A very fascinating article. I had Turner through mid May, and lost my patience and let go of him. And about 4 days ago, thankfully he was still on wire and picked him up and he is paying off as of now….